Last week I reported on Power A's MOGA portable gaming system for Android devices, a system that allows developers to quickly integrate game pad support into their Android titles. 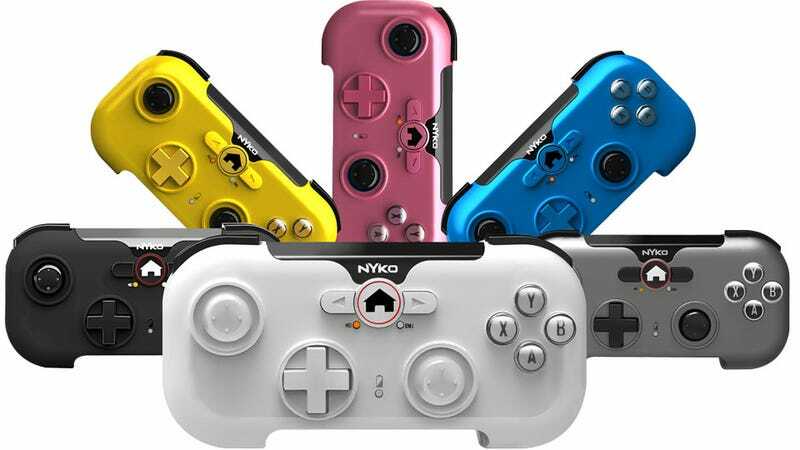 Nyko's PlayPad line of tablet controllers might not be quite as elegant, but they make up for that lack of style by being compatible with just about every Android game in existence. Rather than relying on a software solution, Nyko has teamed up with NVIDIA, the company that makes the Tegra processors that power today's increasingly powerful Android tablets to create the PlayPad and PlayPad Pro, a pair of Bluetooth controllers optimized for high-powered Tegra 3 gaming. The smaller PlayPad, about the size of as Super Nintendo game pad, comes in a variety of colors and is packed in a special case that comes with a plastic stand to hold your tablet upright as you play. The PlayPad Pro is a larger controller that features a similar look and feel to Nyko's Raven wireless controllers for the PlayStation 3, my preferred third-party PS3 pad. Instead of a special software development kit, the PlayPad line utilizes the standard human interface device protocol supported by today's leading Android hardware and software. Working with NVIDIA means that every game that shows up in the TegraZone game store will work with the controllers without any configuration needed. For non-supported games Nyko has prepared a free app called Playground that elegantly allows nearly any game to work with the PlayPad in short order. Some games natively support mapping. For those that don't, Playground will let players snap a screenshot of their game and then drag controller elements onto the picture to create custom mapping. Say you've got an on-screen button in your role-playing game for drinking a potion. Snap a picture, drag one of the controller's face buttons to the area the button appears, and you're good to go. The smaller PlayPad might be a bit too tiny for those with larger hands, but the PlayPad Pro feels just like a console controller, especially when connected to a tablet using its video out to display on a big screen television, a configuration I fiddled with during my Nyko meeting at E3 last week. That's two Android gaming solutions I saw during last week's festivities, both that make a whole lot of sense. It should be interesting to see if Nyko or Power A comes out on top. Hopefully I'll be able to get my hands on a fancy new quad core Tegra 3 tablet before the battle begins this fall.